Following the airing of Super Bowl LIII on Sunday night, CBS premiered one of the most-ambitious talent shows of all time in The World’s Best. This show has brought incredible performers from all over the globe together, and that includes the subject of this interview in Matt Johnson. 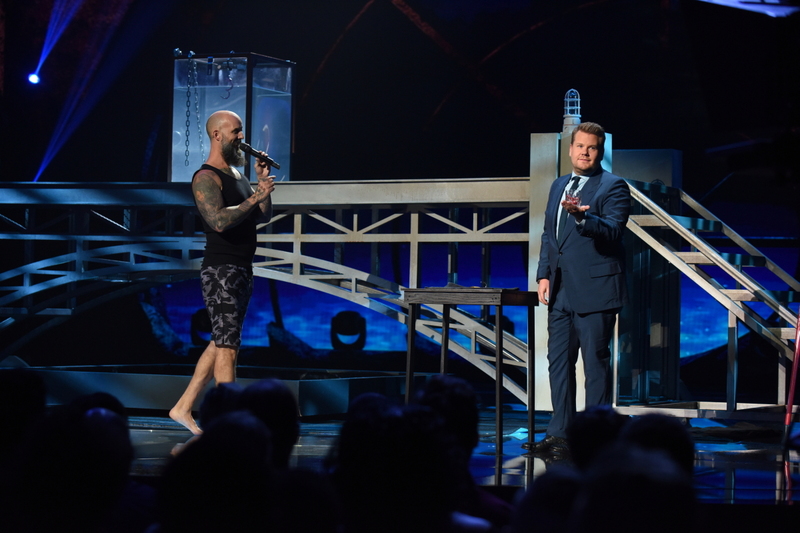 He is a tremendous magician and escape-artist originally from the United Kingdom, and in the closing minutes of the premiere, you had a chance to see him undergo a dangerous water-tank escape that ended in a cliffhanger. How does it end? You will find out tonight starting at 8:00 p.m. Eastern time. Below, Johnson describes the powerful story that led to him doing this particular act, the thrill he gets from being a part of The World’s Best, and also what he does to keep himself from panicking in the midst of holding his breath and trying to escape while submerged in a tank. CarterMatt – You’re a very recognizable guy, and this isn’t the first show that I’ve seen you perform on. Do you find yourself now being approached and recognized a lot now? How different does your life feel? Has it changed me? My life has become so different over the past year. At this time last year, nobody knew who I was and I was doing small shows back home. Literally, in twelve months it has changed. But, it hasn’t changed me. I’m really grounded and a family guy. I do these crazy things, but when I’m not doing them I’m a pretty down-to-earth, quiet guy. I get recognized because of the way I look — it’s a pretty distinctive look. It’s an incredible boost to my ego to be honest (laughs), but as far as this show goes, it’s still in the early days. We’ve only had one show and it’s ended with a cliffhanger. This is the biggest show I’ve ever done. It’s such a global show and this is changing the game for me. I really don’t know how it’s going to change me life, but I’m ready for it. I want to talk a little bit about your background because you talked on the show Sunday about how you started doing this particular water escape as a way to connect with your brother [who has a medical condition]. It’s an interesting juxtaposition in that you’re doing something so scary, and yet you’re doing it for this genuine, kind reason. When did you first decide that this was something you wanted to do? To backtrack a little, I’ve been a magician and an illusionist since I was around twelve years old, and I’ve performed professionally since I was 18. I’ve been a performer for a long time, but I was a very different style of performer — an improv comic and a magician. I didn’t have a beard or tattoos. It was about three years ago when I kind of did a 180 and realized that I really didn’t enjoy performing the way I’ve been doing it. I wanted to do something different. Around that same time, I was in the UK where a lot of my family lives. I’d seen my brother have three seizures in a row; it’s something that he was born with and we’ve seen this for our entire lives. When my brother has three in a row, he holds his breath for five or six minutes. He goes into a coma and his lips go blue. He’s in the hospital. It’s incurable for my brother. I just remember coming away from that [experience] — it was so jarring and so shocking for me that I just get to live this life where I’m just a regular guy. I wake up in the morning and live my life, and my younger brother deals with this. I really felt like I needed to understand what he was going through. I basically started going to a swimming pool — never for a performance or for my act. I started going three or four times a week when it first started to open and I’d tell the lifeguards what I wanted to do. I would just go down to the bottom of the pool with weights until I couldn’t hold my breath anymore. It was from twenty seconds to thirty seconds to forty seconds, and I did this for a good seven or eight months for no reason whatsoever. It wasn’t about income or about money; it was about understanding that if my brother could do it, then I could do it. Then, the next progression was that in order to really understand, I had to put myself in a position where I couldn’t get out if I wanted to. I had a tank built by a plastics company — I put it in my friend’s backyard, I filled it with water, and I climbed in. I could manage to hold my breath in a swimming pool for three or four minutes; in that tank, at first I couldn’t last twenty seconds. I just freaked out! Your heart rate goes up and it burns oxygen. I was done. That began another year, year and a half of finding myself and learning about all kinds of things — how to meditate, how to pick locks, how to hold my breath in adverse situations, and how to deal with everything. That’s when I started to really figure out what my brother was going through. That’s when I really understood. When he has a seizure, he clamps his teeth down and he can’t breathe. He’s trapped until it’s over. That’s really where everything stems from. It’s interesting — there are free-divers and people who can hold their breath for five minutes, seven minutes. The difference is that even though I can hold my breath for four minutes in a swimming pool, I’m relaxed and I’m not thinking. The second you crush yourself into a box and you put locks on and chains and lock the lid, it’s impossible, no matter how hard you train, to not somehow panic. The second you have a thought of panicking a little bit, thinking burns oxygen, panic burns oxygen, your heart rate goes up, and you’re done. You’re out. The best free-divers in the world wouldn’t want to go in these situations. It’s against human nature. It’s a very different situation to understand until you’re in there and the locks go on and you start to understand your psyche. It’s a different game. …Which immediate [pushes] your heart-rate up! You know that you’ve got twenty million people watching and there’s RuPaul, Faith Hill, Drew Barrymore, and James Corden. I can tell you right now that when I am dropped in that situation, my heart-rate is a million times a minute. It is through the roof and that is against everything I should be doing. I should be lowering it as low as I can be. I don’t particularly enjoy doing the act, but I do it because of my brother and every time that I’m in there and I don’t think I can do this anymore, I think of him. That’s the only thing that I think of. If he can do it, I can do it. If he can do it for his whole life, I can do it for however long it takes me to get out. That’s the driving force behind what I do — it’s my destination in life. It’s what I’m here for and it’s thrilling to watch. What I always appreciate about acts like this is, beyond the fact that I could never do it, is just the mystery of it all. It’s the shock that someone is capable of this and the drama that comes with that. When you’re performing this act at your shows, how does the audience respond to it? What do you think they’re there for? Houdini had a very famous saying — ‘nobody wants to see me die, but everybody wants to be there when it happens.’ It’s like when you pass a horrendous car crash on the highway: It’s human nature — we have to look. We don’t know if it’s because we want to see the wreck, or because it makes us feel better about ourselves that we’re safe. Ultimately, I just think from a core level it’s compelling and thrilling. That’s the amazing thing about this show — unlike some of the other shows that I’ve done, and I’ve loved every show that I’ve done, it’s starting from a place where we’re not auditioning for the show. We’re all there because we were all hand-picked to be the top 50 acts in the world. Every single act you see on that show is compelling for those exact same reasons. It’s the unknown. Even we don’t know if it’s going to work out the way we want it to. It’s like even with you — you’re doing an interview, and maybe somedays the interview doesn’t go as well as you thought it would. You just don’t know what’s going to happen. When people are watching, they don’t know if we’ve got it — they’re hoping we are professional enough, but there are so many unknowns in these stunts. That’s what makes it so compelling. It’s like a free-climber who is climbing up a cliff. They do it because it’s a rush; living life on the edge like that is what’s so thrilling about life. It gives you a completely different outlook. Whenever I am able to get out of that tank — just getting a breath of air when I’m getting out is the best feeling in the world. So when you’re on a show like this and you’re devising that first performance, do you try to just be in that moment? Or, do you also try to think ahead to whatever the next performance is, in the event you advance? I don’t know what other performers do, but I know for me I always think that you never really know if you’re going to make it to the next round. A big part of it for me is that when I’m doing my escape, I don’t know if I’m going to make it through. I don’t know if I’m going to have to be let out early. I’ve tapped out way more in rehearsals than I’ve ever actually escaped. It’s painful. For me, I can only really think about the one thing that I’m doing at the time. For me, putting any energy into what I would do if I made it through would take away from the energy that I’ve gotta give to the performance that I’m doing. It’s so mentally demanding. This isn’t to say that I don’t have ideas, but they have to remain ideas until I find out if I go through or don’t go through. Then, I can put the energy into those ideas. I tend to just take things one step at a time. So when did you find out about the show premiering after the Super Bowl, the most-watched [US] television event of the year? You couldn’t have asked for better timing. I found out around the time you guys found out. Someone messaged me the first preview and told me that I was in a TV ad! I didn’t even know the ads were being shown at that time. I actually found out after some other people did. It’s a dream come true [to air when we did] — as performers, regardless of whether we make it through or not, because this changes our lives. I didn’t find out until you guys found out that I was going to end the first show and it was going to be a cliffhanger! I get two episodes and that’s amazing! Then, I was [on The Late Late Show with James Corden]. How amazing? That’s three times for my performance — regardless of what happens, I’ll be forever grateful to the team at The World’s Best. These are the things that change lives — and pay my mortgage (laughs). I’m floating on air and I don’t take it for granted. I’m looking forward to the future, whatever that will bring.